In recent years, the growth in civil litigation claims has outstripped the overall growth in claims. For example, from 2006 through 2010 LAWPRO received an average of 708 civil litigation claims each year, and during 2011 through 2015, the average increased to 948 each year. This growth of 34 per cent vastly exceeds the 7 per cent total growth of claims for all other areas of law over the same time period. In addition, costs of civil litigation claims have remained resiliently high. During 2007 through 2014 the average annual cost of these claims was $5,935 per civil litigation practitioner, an amount far in excess of what was collected in premiums (including civil litigation transaction levies). 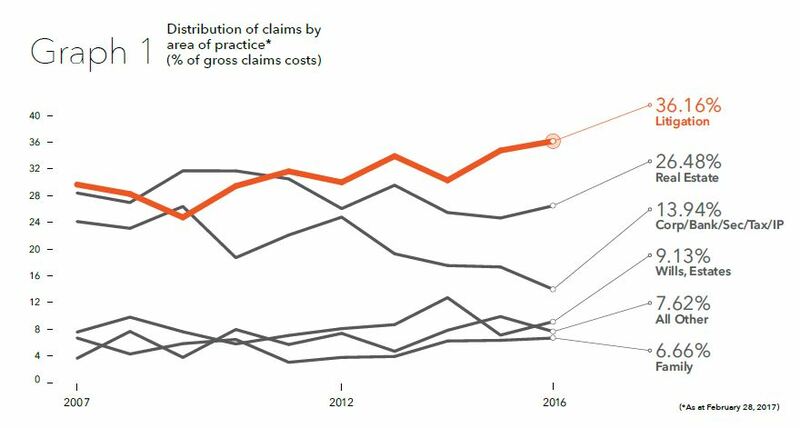 As seen in below, on a gross claims cost percentage basis, litigation claims have shown an upward trend and have exceeded real estate claims since 2011. There are a multitude of deadlines that must be met when handling litigation matters. Right out of the starting gate, there are notice periods and limitation periods that can’t be missed. Next, issuing a claim creates a cascading series of deadlines that have to be met: serving the claim, responding to pleadings, serving and sticking to a discovery plan, serving an affidavit of documents, responding to undertakings given on discovery, serving expert reports, setting down for trial, and so on. Reflecting the deadline-driven nature of litigation practice, 42 per cent of litigation claims are caused by missed deadlines and procrastination. As noted above, administrative dismissals under the old Rule 48.14 were very costly for LAWPRO. Thankfully, the new Rule 48.14 appears to have reduced administrative dismissal-related claims, but there are still risks that the new processes and deadlines will trap unwary lawyers. On a rolling basis matters commenced on or after January 1, 2012 are being automatically dismissed five years after they were commenced. And unlike the regime under the old Rule 48.14, these dismissal orders go out without notice to counsel or parties. As of the start of this year the courts in many jurisdictions are sending dismissal orders promptly when the five-year dismissal deadline occurs. LAWPRO has started to see claims from these dismissals. Law firms are encouraged to update their internal firm systems to tickle relevant Rule 48.14 dismissal dates on all files. 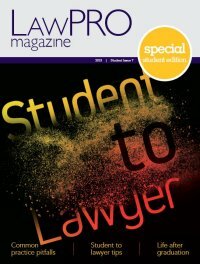 LAWPRO also encourages lawyers to be proactive and keep their files moving along. Repairs may be harder under the new Rule 48.14 as you will have had five years to move a matter along, not the two years as was the norm for a dismissal under the old Rule 48.14. Consider using LAWPRO’s Rule 48.14 Transition Toolkit (practicepro.ca/rule48), which provides advice and tools for lawyers and law firms to lessen the risk of a claim under the new Rule 48.14. Notwithstanding the Limitations Act, 2002 has been in force for more than 13 years, we continue to see claims due to lawyers’ unfamiliarity with the Act’s limitations rules, or more frequently, misapplication of the discoverability rules contained in the legislation. In some cases, the date on which the claims was discovered or was reasonably discoverable is not self-evident. “Threshold” claims are a good example – when did the client know that his or her injuries met the “threshold” prescribed by the Insurance Act? Failure to give a municipality 10-days notice after the occurrence of a personal injury on a municipally-controlled highway, bridge or sidewalk. may be one such reason. Discoverability may, or may not, extend the limitation period beyond the two year anniversary date of the action. Litigating this point is extremely expensive, even where successful. Lawyers are encouraged to take the time to review the Limitations Act, 2002 and the related jurisprudence: See practicePRO’s limitation period resources at practicepro.ca/limitations. See also the comments on the ultimate limitation in Don’t let claims follow you into retirement. Failing to provide the client with breakdown of settlement monies when obtaining instructions to settle, including a clear “take home” amount that represents what the client will receive, and how much would be paid to the lawyer as fees, costs, disbursements, & HST. 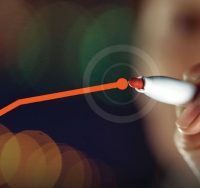 On claims involving communications errors, the lawyer and client will frequently disagree on what was said or done during the course of a matter. As claims often happen years after a matter is closed, lawyers often don’t remember what transpired due to the passage of time. Even if a lawyer remembers some details, LAWPRO usually finds that there is little or no documentation or notes in the lawyer’s file to substantiate the lawyer’s account. In contrast, as a legal matter is typically a once in a lifetime event, clients often have a much more specific memory of what transpired. In LAWPRO’s experience, these types of claims tend to come down to credibility, and the client’s more specific recollection will often carry the day. The simple conclusion – and excellent risk management advice – is that detailed notes of client conversations and reporting letters can be extremely helpful for LAWPRO when defending communications-related claims. Take notes of conversations with the client, and document in writing discussions involving options, strategies, outcomes or settlements. In particular, document circumstances where the client does not follow your advice or recommendations, and even better, send an email or letter confirming this. You can’t, of course, make and keep notes of every discussion. But some small tricks can help you capture details of client interactions. A short email can document a conversation. Detailed time entries can also capture interactions. “Conference with client re risks and costs of litigation” is much better than just “Conference with client re lawsuit.” But don’t enter sensitive information as time entries can end up before a court in cost submissions. Lawyers are increasingly using email to communicate with clients, something that can result in misunderstandings. Clients and lawyers may miss the meaning of what is said, read between the lines and make incorrect assumptions, and they might overlook an email. During a long litigation matter, arrange some face-to-face meetings, or at least a phone call if distance is an issue. Face-to-face discussions are better than email when the discussion relates to important topics or when there is bad news. Make sure you keep your clients informed of the progress of their matters. Failing to properly assess accident details, injuries or income loss due to not obtaining or reviewing investigation reports, medical reports or other expert reports. To avoid this type of claim, be diligent in your work. Take the time to read between the lines so you can identify all relevant issues and concerns on the matter you are handling. Ask yourself: What does the client really want? Does everything add up? Are there any issues or concerns that should be highlighted for the client? If something doesn’t add up – dig deeper. While a client will want to keep legal fees down, you should resist pressures to take shortcuts, unless the client is aware of the risks of doing so, and the required work or advice was provided to the client. If you find yourself struggling with a difficult client or opposing counsel, or the options or strategy that you should recommend to a client, seek help from a firm colleague or from an external mentor. The Law Society’s Coach and Advisor Network (CAN) (lsuc.on.ca/coachandadvisor) provides lawyers and paralegals with access to shorter-term, outcome-oriented relationships with Coaches and Advisors drawn from the professions. From the claims LAWPRO has seen, it is clear “dabblers” (lawyers acting outside of their usual practice area) are more likely to commit malpractice errors, and in particular a failure to know or apply substantive law. Lawyers who are asked to handle a legal matter for a family member seem to feel obliged to help and often find themselves dabbling in an area of law they don’t know. Dabbling is dangerous – don’t do it. As is noted below, only 13 per cent of litigation claims ultimately result in an indemnity payment. And while 87 per cent of claims are resolved without an indemnity payment, it still makes sense to do everything you can to avoid the stress, time and cost of dealing with a malpractice claim. The majority of litigation claims involving lawyer/client communications errors and missed deadlines or procrastination are easily preventable. Take some proactive steps to address these types of claims as it is your best opportunity to reduce your claims exposure. 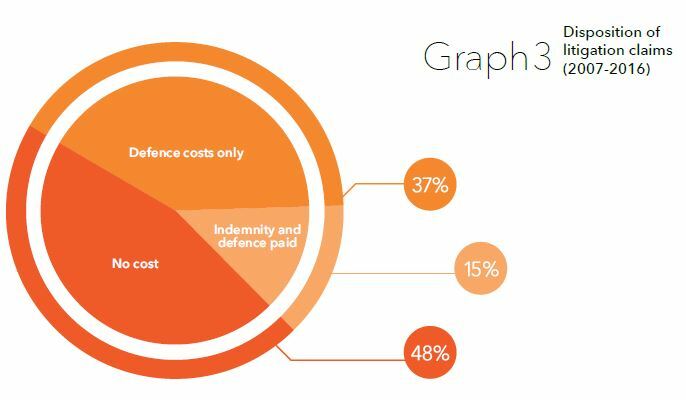 On average, LAWPRO opened 823 litigation claims per year over the last ten years.1 During this period only 13 per cent of litigation claims required an indemnity payment. As graph 3 shows, LAWPRO successfully defended the lawyer on 87 per cent of litigation claims. And breaking down the 87 per cent, 48 per cent of these claims were closed without any costs whatsoever, and 37 per cent were closed with defence costs only (i.e., cost of hiring outside defence counsel). These statistics should help lawyers overcome any reluctance they have to report a claim to LAWPRO. If you report a claim and nothing develops, your deductible won’t be triggered and there won’t be any surcharged increase in your premium. Further, a failure to report promptly can lead to missed limitation periods, adverse judgments, imprudently-brought appeals or lost appeal opportunities, or other negative outcomes that could have been avoided or mitigated if LAWPRO had been notified sooner. If LAWPRO has the opportunity to act early – even before a claim is asserted – we have a better opportunity to gather and secure evidence, seek settlement, and assist you in avoiding a claim being made at all. It’s far riskier to delay or attempt a DIY repair and have your coverage denied. And remember, a delay or self-repair could also jeopardize your firm’s excess insurance coverage.